President Of The Theosophical Society 1907-1933. Issued As A Transaction Of The Η.Ρ.Β. Lodge, London. London, Benares And Adyar (Madras). 1907. Sixteen years and a half have gone since Helena Petrovna Blavatsky passed away from this mortal world. Yet attacks are still made upon her veracity, upon her character, and good and sympathetic men still turn away from the Theosophical Society with: “Oh! Ι do not care to belong to it; it was founded by Mme. Blavatsky, who was convicted of fraud by the Psychical Research Society.” The articles which defended her at the time have long been out of print, and are forgotten; Dr. Hodgson, the writer of the S.P.R. report, became a believer in phenomena far more wonderful than those which he denied in his youthful self-confidence, and also became himself the victim of misrepresentation and ridicule. The large circulation of Mme. Blavatsky’s priceless works, the spread of the ideas which she spent her life in learning and teaching, the growth of the Theosophical Society which she founded at the orders of her Master, and with the aid of her colleague, Colonel Η. S. Olcott, the ever-increasing literature published by her pupils—all these form her substantial defence, the justification of her life’s work. But it is not right that the continued crucifixion of the Teacher should be regarded with complacency, while the world profits by the teachings, nor that she should be branded as fraud and impostor who brought to this age the truths now gaining such world-wide acceptance. It is but just that her defence should be obtainable so long as she is slandered. Therefore Ι—who reverence her as my first Teacher, and who keep her in my heart with unceasing gratitude as the one who led me to my Master, whom Ι have now served with ever-increasing thankfulness for more than eighteen years—place here on record the facts of the past, with such comment as seems necessary. Fadéeff, daughter of Privy-Councillor Andrē Fadéeff and the Princess Helena Dolgorouki. The following letter—translated from the French original, which lies before me—by Lieut.-Major-General R. Fadéeff, to Α. Ρ. Sinnett, Esq., c/o Η. Η. the Viceroy’s Private Secretary, through the Prince Dondoukoff-Horsanoff, Governor-General of the Caucasus, testifies to her identity: “Ι certify by these presents that Madam Helena Petrovna Blavacki,  now dwelling in Simla (British India), is, on her father’s side, daughter of Colonel Peter, and grand-daughter of Lieut.-General Alexis Hahn de Rottenstein-Hahn (a noble family of Mecklenburg, settled in Russia), and, on her mother’s side, daughter of Helena Fadéeff, and grand-daughter of Privy-Councillor André Fadéeff, and the Princess Helena Dolgouki, and that she is the widow of the Councillor of State, Nicéphore Blavacki, late Vice-Governor of the Province of Erivan (Caucasus). Joint Secretary of the Minister of the Interior, Count Ignatieff, Attaché of the Έtat-Major of the Minister of War. S. Petersbourg, Little Morskaia, 23. Ι have met; but when she was here this power was in a condition far inferior to that which it has now reached. My niece Helena is a being quite apart, and cannot be compared with anyone else. As child, as young girl, as woman, she was always too superior to her environment to be appreciated at her real value. She received the education of a girl of good family. She was well brought up, but was not at all learned, and as for scholarship, of that there was no question. But the unusual richness of her intellectual nature, the delicacy and swiftness of her thought, her marvellous facility in understanding, grasping and assimilating the most difficult subjects, such as would require from anybody else years of laborious study; an eminently developed intelligence, united with a character loyal, straightforward, frank, energetic—these gave her such an unusual superiority, raised her so high above the ordinary level of the insipid majority of human societies, that she could never avoid attracting general attention, and the consequent envy and animosity of all those who, in their trivial inferiority, felt wounded by the splendor of the faculties and talents of this really marvellous woman. again help us. She writes from Paris, under date June 26th, 1884:”Ι wrote to Mr. Sinnett two or three years ago, in answer to one of his letters, and Ι think that Ι told him what occurred in connection with a letter received by me phenomenally, when my niece was on the other side of the world, or when, to speak the fact, no one knew where she was—which was exactly the thing that troubled us. All our enquiries had ended in nothing. We were ready to believe her dead, when—Ι think in the year 1870, or soon after—Ι received a letter from the Being whom you call, Ι think, Koot-Ηοοmi, which was brought to me in the most incomprehensible and mysterious way, in my own house, by a messenger with an Asiatic face, who vanished before my eyes. This letter, which begged me not to be anxious and assured me that she was safe, is still in my possession, but at Odessa. When Ι return Ι will forward it to you, and Ι shall be very glad if it is of use to you. Excuse me, but is difficult, almost impossible, for me to believe that there can be people sufficiently stupid to think that either my niece, or yourself, invented the men whom you call Mahātmās. The following dates are taken from a scrap of paper, found at Adyar, in a writing Ι do not recognise, and unsigned. Ι give them for what they are worth. In 1848, immediately after her marriage, she left the Caucasus and went to Egypt, travelling with the Countess Kiselef. She visited Athens, Smyrna and Asia Minor, and made her first effort to enter Tibet, but failed. In 1853, at the time of the visit of the Nepaulese Embassy to London (but in 1851, according to her own diary), she was in London, and met there her Master. Thence she went to South America, and through the Pacific islands to India, and made her second ineffectual attempt to enter Tibet. She returned to England, viā China, Japan and America, about 1853. She then travelled to the United States and Central America, and back to England in 1855 or ’56. Thence she again went to India, viā Egypt, and just before the outbreak of the Sepoys she made her third unsuccessful attempt to enter Tibet. She then disappears, turning up in Russia at the end of 1858 or beginning of 1859. She was in Tiflis from 1861 to 1863, and then went to Egypt, and thence to Persia, crossing over Central Asia and penetrated to Tibet about 1864. She paid a flying visit to Italy in 1866, and then back to India and the north, to the Kumlun mountains and Lake Palti and Tibet. She returned to Odessa, viā Egypt and Greece, in 1872. Report of the Result of an Investigation into the charges against Madame Blavatsky. Pp. 95, 96.
shortly went on to Russia, and thence to France and America, meeting in the latter country Colonel Olcott, with whom, on November 17th, 1875, she founded, in pursuance of the order she had received, the Theosophical Society. The story of that time may be read in the Old Diary Leaves,  by Colonel Olcott, wherein is given an account of her extraordinary powers, and of the phenomena which surrounded her. From America, the two founders came to India, and fixed their headquarters for a time in Bombay. There Madame Blavatsky received a letter from Madame Coulomb, dated June 10th, 1879, telling her of the troubles she had passed through, and begging her to lend her Rs. 200. In the late spring of 1880, she and her husband came to Bombay in great poverty, and Madame Blavatsky took pity on them and helped them, afterwards establishing them in the headquarters at Adyar, Μ. Coulomb as librarian and man-of-all-work—for the library was in the future—and Madame Coulomb as housekeeper and caretaker. If human evidence can ever substantiate a fact, the fact of the appearance of the Masters, and of the communications received from Them during these years, is placed beyond the possibility of doubt. Let me take a few at random. Mr. S.
 It would be useless to fill these pages with quotations from books now in circulation, and which can be consulted by anyone wishing to know the facts. Report of the Result, etc. Pp. 131, 132. As already said, Ι am not giving here evidence open to all in books now in circulation; any serious student can study The Occult World, with its invaluable information, for himself. Hints on Esoteric Philosophy.Pp. 72, 73. These appearances of the Masters were not, however, confined to the Headquarters at Bombay and at Madras. Hints on Esoteric Philosophy. Ρ. 105. Report of the Result, etc. Pp. 76, 77. Report of the Result, etc. Pp. 74, 75. Report of the Result, etc. Pp. 82-84. Ibid.Pp. 79, 80. Ibid. Ρ. 74  Ibid. Pp. 85, 86. Ibid. Ρ. 89. Here we have a number of independent witnesses, bearing testimony to their meeting these same Masters in the flesh. He had broken off his conversation with Madame Blavatsky in order to go downstairs for the pincers. Report of Observations made during a nine months’ stay at the Headquarters of the T.S.By F. Hartmann, M.D. Pp. 29-30. Report of the Result, etc. Pp. 61, 62. The questions and answers are printed in the Theosophist for July, 1907. Ι copied them from the original document. Report of the Result, etc. Pp. 6ο, 61. Ibid. Pp. 77-79. M. Coulomb was there. As the latter was lighting his cigarette, Damodar felt a slight electric shock, and saw a letter lying at his feet; it contained a reply to his thought, as well as some information to be sent to a brother Theosophist. During Madame Blavatsky’s absence in Ootacamund, in July, 1883, various letters were received in the Shrine at Adyar, Damodar placing them within it and taking out the replies. He also received letters in the well-known writing before and after the coming of the Coulombs, away from Headquarters as well as in them, and notes written on letters from others, delivered into his own hands by the postman. In all these cases, Madame Blavatsky was away, but the writing was identical with that of the letters so often received through her instrumentality. On the 1st August, 1884, Madame Blavatsky being in England, Colonel Olcott and Dr. Hubbe-Schleiden were travelling from Elberfeld to Dresden by express. As the latter partly rose from his seat to hand the railway tickets to the guard, Colonel Olcott noticed something white lying on the seat; it turned out to be a Tibetan envelope, in which was a letter from Mahātmā Κ.Η. in His well-known writing. Mrs. Morgan, the wife of General Morgan, said: “I can state for a fact, that during my stay at Adyar, during December, 1883, Madame Blavatsky took Mr. C. and myself and showed us the back of the shrine, and the wall she had built behind it, where there had been a door, and the people were welcome to inspect this and see it was barred and bolted; yet she thought it would remove the least occasion for suspicion were it bricked up, and so had it done. The wall then presented a fine, highly polished, white surface. This wall Ι shortly afterwards saw papered, as Ι superintended the hanging of the paper.“–Report of the Result, etc Pp. 99,, 100. Colonel Olcott carries the date up to the 15th February, 1884, a week after Madame Blavatsky had left Adyar. On the 15th December, 1883, he had been told to try a certain experiment by making some marks “on the spots of the wall corresponding to the centre and four corners of the cupboard.” He removed the shrine for this purpose, and, having made his experiment, rehung it in its place. After the Anniversary, he went to Ceylon, returning to Adyar on February 13th, 1884, i.e., after Madame Blavatsky’s departure, and leaving again to join her on February 15th. During this time he again took down the shrine in order to examine the marks, and at that date he found no hole in the wall. It must be remembered, in this connexion, that no one has ever made the slightest imputation on Colonel Olcott’s honor. He has been called a dupe, but never an accomplice. The testimony as to the nature of the Shrine, and of the wall behind it, is overwhelming. Judge Sir S. Subramania Aiyer, of the High Court, Madras, is perhaps the most highly respected Indian in Madras, honored alike by Europeans and Indians. He states (January 10th, 1884), that he was present at Adyar during the Anniversary of 1883, and saw certain phenomena there on the 26th and 28th of December. “The room in question is situated upstairs. In the room is. the shrine—a wooden cupboard, put up against a wall. It is not fixed to the wall, but only touches it. Ι have carefully examined the shrine inside and outside, and also the wall against which it is put. Ι found nothing to suspect the existence of any contrivances which could account for what Ι saw. Inside the cupboard are two framed likenesses of two of the Mahātmās overhung with pieces of yellow silk, a silver bowl and some images. . . .
 Report of a Result, etc. Ρ. 102. The value of the evidence of the Editor of the Philosophic Inquirer, Mr. Ρ. Ruthnavelu, is great, because he examined the shrine and its surroundings before and after the missionary attack. He writes: “Ι witnessed a phenomenon (on 1st April, 1883), a full account of which was published by me in the Philosophic Inquirer of the 8th April, 1883. Ι went up to the shrine with two sceptical friends of mine, and the doors were opened for me to inspect closely. Ι carefully examined everything, touching the several parts with my hand. There was no opening or hole on this side of the cupboard. Ι was then led into the adjoining room to see the other side of the wall to which the shrine is attached. There was a large almirah standing against this wall, but it was removed at my request, that Ι might see the wall from that side. Ι tapped it and otherwise examined it, to see if there was no deception, but Ι was thoroughly satisfied that no deception was possible. Report of the Result, etc. Pp. 63, 64. Report of the Result, etc. Ρ. 97. Ibid. Ρ. 99. Ι might add to these statements, but it seems scarcely worthwhile to do so; they are already so conclusive. But the facts are important, as the first part of the Coulomb plot, and of Mr. Hodgson’s Report, centred in and round the Shrine. A few phenomena, out of the many connected with it, may be put on record here, though it may be remarked that the Shrine was in existence but a short time, and played no part in the great majority of the phenomena connected with Madame Blavatsky. Reply to Report of an Examination by J. D. Β. Gribble. By Η. R. Morgan, Major-General. Pp. 14-17. Report of the Result, etc. Ρ. 59. Ibid. Pp. 63, 64. Report of Observations. Ρ. 25.
great. Dr. Hartmann proceeds: “She had arrived at Headquarters penniless, and had been taken into the house by Madame Blavatsky, out of charity, and been given full control over everything, including the purse; and when she left the Headquarters she sported a large roll of bank-notes. (The household expenses at the Headquarters since the Coulombs left have been each month 230 to 270 rupees less than the monthly expenses during their presence).” Besides, there were many generous visitors, and “loans” could be obtained; the failure to gain one of these led to the catastrophe. Prince Harisinghji, of Kathiawār, cousin of the Mahārāja of Bhavnagar, was at the Convention of December, 1883, and Madame Coulomb approached him with a request for a loan Rs. 2000. The Prince evaded the request, saying that perhaps he would help her some day, and departed to his home. Ibid. Ρ. 31  Ibid. Ρ. 32.
rupees. . . . On another occasion, in Dr. Dudley’s house in Bombay, she said that she hated Madame Blavatsky.” Major-General Η. R. Morgan writes, as follows, about the Coulombs: “They were received by Madame Blavatsky, at Bombay, in a penniless state; were befriended by her, because they had rendered her some assistance in Egypt. The woman Coulomb became a sort of confidential housekeeper, and, as Mr. Gribble truly remarks, was the cause of Mr. Wimbridge and Miss Bates leaving the Society at Bombay. By this we see she began her malicious interference early. “That malice is her chief characteristic Ι will show by the following: When at Bombay she tried to sell her knowledge of the Society to the Guardian, a Bombay paper, when she could have known very little, and when the correspondence now sold to the Christian College Magazinewas not in existence nor the false phenomena which she now records; it is evident she was, so long ago as 1879, prepared with fabricated letters and phenomena. At that very time her Machiavellian nature prompted her to prepare for the downfall of her benefactor, for she asserted to more than one Theosophist that she had never thrown away a slip of Madame Blavatsky’s writing, and had been the lucky finder of mischievous letters blown to her feet by the wind! Why should she have laid such store by these scraps when she was the possessor of the voluminous correspondence she has now so profitably disposed of? When we consider the characteristics of this woman, her eaves-dropping, purloining of letters, her hatred of the members composing the Society, her swearing she would be revenged, her incessant espionage of Madame Blavatsky, and those she might be talking with, the motive and manner of her concocting these letters is not difficult to understand. Her malice carried itself to such an extent that she actually kept a pack of mangy diseased dogs to worry the high caste Brahmins, and drive them away. Her object was to have sole possession of the purse, and access to the purses of others, and when her little plans were frustrated by Madame Blavatsky, she hated her accordingly. Report of the Result, etc. Pp. 133, 134. This was the woman whom Madame Blavatsky, with characteristic carelessness—sure of her own honesty and ever too trustful of the honesty of others—left in charge of her rooms at Adyar; but she had been sufficiently annoyed by the Harisinghji incident to ask Dr. Hartmann to get rid of the Coulombs before her return. Reply to a Report, etc. Pp. 3 – 5. Report of Observations, etc. Ρ. 33. Ibid. Report of Observations, etc. Ρ. 57, note. Τ. V. Charlu’s letter. Judge Srīnivāsa Rao’s own report has been given previously. But this calm was deceptive. Colonel Olcott received in London an envelope, post-marked Madras, containing a letter addressed to Madame Coulomb—then at Ootacamund—from Adyar, under date April 28th, 1884, by Dr. Hartmann. It expressed the writer’s disbelief in Madame Blavatsky, and alleged that Mr. Lane-Fox had “received secret instructions from the London Fellows” to find out about her trickery. The letter was ill expressed and ill spelt, and the Colonel wrote to Dr. Hartmann, under date July 20th, 1884, that “Ι offset my personal knowledge of you against this blackguard note.” He further said that he had put it away in his dispatch-box, but had noticed that morning on turning over the papers, that the Master had written on it, and that He then told him to send it on to Dr. Hartmann. Dr. Hartmann remarks that the letter was in “a tolerably good imitation of my handwriting.” Master Μ. had written on it: “A clumsy forgery, but good enough to show how much an enterprising enemy can do in that direction. They may call this at Adyar, a pioneer.” Truly was it a pioneer of the crop of forged letters published in the Christian College Magazine a few months later, and done by the same hand. The Latest Attack on the Theosophical Society. Issued by the Council of the London Lodge. Pp. 17, 18.
with the hatred of failure against success; the Society, Henry, Η. Ρ. B., Theosophists, and, aye, the very name Theosophy. The——— are ready to lay out a good sum for the ruin of the Society they hate. . . . Moreover the J——— in India are in direct understanding with those of London and Paris. . . .
 Report of Observations, etc. Pp. 35, 36. Report of Observations, etc. Pp. 35. 36. The Coulombs left Adyar on May 25th, 1884, the first part of the plot having failed by its too prompt discovery. It was, however, to be revived in the future by the agent of the Psychical Research Society, and, owing to his misrepresentation of the facts, few people know that, admittedly at the time, none of these arrangements existed while Mme. Blavatsky was at Adyar, and while the phenomena were occurring, and that all traces of them had been removed before she returned. They were new in May, 1884, and still incomplete, the wooden back of the Shrine and the wall on which it hung being still intact, so that there was no communication between Mme. Blavatsky’s room and the Occult Room. All was shown to the numerous visitors at Headquarters during the summer of 1884, the wall and panels being left for a time as they were found. Mr. Judge, who came to Adyar on May 26th, thus describes the hole: “It was a rough, unfinished hole in the wall, opening into the space left when the old door had been bricked up. . . . This hole began at the floor, and extended up about 22 inches. From each edge projected pieces of lath, some three inches, others five inches long, so that the opening was thus further curtailed . . . the plaster was newly broken off, the ends of the laths presented the appearance of freshly broken wood, and the wall-paper had been freshly torn off.” These facts were seen and signed to by over thirty gentlemen sent for by Mr. Judge as witnesses. Mr. Judge further tells us that, at his request, Mr. Damodar tried to get into the recess through the hole, but could not; Mr. Judge himself tried and failed, as did a “thin coolie;” finally, “a small boy about ten years of age” squeezed in, but found that he could not stand upright, for there were large pieces of hard mortar projecting from the sides. Mr. Judge then sent for a man, who “in my presence bricked up the aperture, re-plastered it, and, then re-papered the whole space.” And this was done, be it remembered, in the autumn of 1884, before the return of Mme. Blavatsky. Reply to a Report, etc. Ρ. xvi. shrewd a woman to have ever written to any one, anything that could convict her of fraud. It is but a small matter, and yet significant: Would Madame Coulomb, as a confederate in fraud, have written to Madame Blavatsky, on August 13th, 1883: “Ι verily believe that Ι shall go silly if Ι stay with you,” relate the Morgan incident, and conclude with, “Ι say you have dealings with Old Nick,” if, at that time, she was a party to fraud, and had herself arranged the phenomenon, as she afterwards pretended? If she were a confederate, she might well have kept up the farce before witnesses, but she certainly would not have kept it up between themselves in private letters, especially at the very time when, according to her, Madame Blavatsky was writing to her with such shameless openness. Such a gratuitous and objectless falsehood as the letter of Aug. 13th is not credible. The letter is quite natural, from a frightened and superstitious Christian; it is incomprehensible from a confederate in an impudent fraud. “Dear Sir,—My attention has been called to a letter from Professor Patterson in your issue of October 31st. My note—to which it is a reply—was called forth by your direct challenge to myself to investigate the evidence against my friend, Madame Blavatsky, and Ι had no intention of provoking a prolonged correspondence. It is clear that we are face to face with absolutely contradictory assertions. Professor Patterson says Madame Coulomb was not paid for the letters: Major- General Morgan says (pamphlet published in 1884, Reply to a Report,etc.) that the Scottish missionaries ‘paid them (the Coulombs) Rs. 150 as a commencement.’ Professor Patterson says every Theosophist who has expressed a wish to see the letters has been permitted to do so. Madame Blavatsky tells me she asked, and was refused; Mr. Β. Keightley tells me he asked, and was refused, and that to his personal knowledge other prominent Theosophists met with the same refusal. Ι do not know Professor Patterson; Ι do know these Theosophists; and Ι prefer to accept their word. maledictions in nature.’ Emphatic, very; but Ι do not lay stress on an oath from such lips. As to Professor Patterson’s final threat, let him publish. If any compromising documents existed, those who used Madame Coulomb can have no scruples which would prevent the publication. Madame Blavatsky is poor, a worn-out invalid; she is not likely to go to India to prosecute him. Madame Blavatsky was eager to prosecute the Christian College Magazine for libel, but Colonel Olcott insisted that the matter, was one for the Society to decide: “Ι have represented to Mme. Blavatsky that it is her duty to be governed by the sense of the General Council, and not to undertake to decide for herself. Ι have told her that she and Ι, having called into existence this important Society, are now bound to consider ourselves its agents in all things affecting its interests; and that we must subordinate, to the prime question of its welfare, our private reputations, no less than our strength and our means.” A committee was appointed, and unanimously decided that she should not prosecute; she reluctantly submitted, only half comforted by the vehement affection and trust shown towards her. Ninth Report of the T.S., p. 12. This issue also contains the Report of the Committee. The Occult World Phenomena. By Α. Ρ. Sinnett. Pp. 2-4. The Occult World Phenomena. Ρ. 47. “The so-called ‘shrine’ was a simple cupboard hung loosely to a wall in Madame Blavatsky’s room, Ι examined it on this occasion [the evening of his arrival] and more carefully afterwards, and found it like any other cupboard provided with shelves, and a solid unmovable back, hung upon an apparently solid and plastered wall. However, as a door had been in that wall before, which, as Madame Blavatsky told me, had been walled up, and as a wall without any adequate support from below would be so very heavy that the joists upon which it rested might give way, the interior of the wall was not filled up with bricks, but was left hollow, leaving a space between the bricks of some twelve inches in depth.” (Report of Observations, etc. Ρ. 12). blocked-up door was made to slide—this is presumably the hole made in the partition, the door having been removed; lastly a sliding panel was made in the back of the wardrobe. If anyone went into the wardrobe, opened the back of the wardrobe and the panel of the door—with blows of a mallet, to announce his coming?—he could slip into the space between the door and the brickwork—if a very small boy, who did not object to suffocation—and then, through the hole in the brickwork, slide up the top of the panel in the cupboard—which would thus appear to the expectant letter-receiver in the Occult Room, and explain the blows of the mallet—and come on the back of the mirror—on the other wall of the room; and push it aside. All this Mr. Hodgson learned from the veracious Μ. Coulomb, and from nobody else. If Μ. Coulomb had added that this was his plan, although he had unfortunately been interrupted in its execution, all would have been sufficiently probable; Madame Coulomb had been a medium in Cairo, of not very good reputation, and Μ. Coulomb may have acquired his carpentering skill and his ingenious ideas in her service; the Coulombs may even have thought of utilising the Shrine—with its already high reputation—for phenomena of their own, with the view of increasing their slender resources; for Madame Blavatsky tells how angry Madame Coulomb often was with her, because she would never show any phenomena for money, nor produce them in a way to bring about gifts. Madame Coulomb could not see the sense of neglecting such an obvious way of filling an often depleted exchequer, and it is possible that the making of holes and sliding panels was intended for the use of the Coulombs only, with a view to extracting cash from the pockets of recalcitrant Indian Princes, rather than as an elaborate plot against Mme. Blavatsky. On the whole of this matter, Mr. Hodgson simply repeats Μ. Coulomb; he is not a judge, but a mouth-piece of an accuser—a soi-disant accomplice, turned King’s evidence. “Μ. Coulomb states,” a “statement of Μ. Coulomb,” “according to Μ. Coulomb”—such are thereiterated assertions. And of evidence of these frauds outside this tainted source—none. There was a book-case on the wall separating the Occult Room from the outer hall, and this panel was behind a mirror, hanging between the two parts of the book-case, with a shelf in front of it; this is probably the mirror spoken of by Μ. Coulomb to Mr. Hodgson, removed into the Shrine, for the sake of the story. To proceed with Mr. Gribble: “This gives the idea of having been constructed so as to place food on the shelves inside, without opening the door. The other contrivance is a sliding panel which lifts up,  and opens and shuts with some difficulty. It is evidently of recent construction. Certainly in its present state it would be difficult to carry out any phenomena by its means. Neither of these two appliances communicates with the shrine, which is situated on the cross-wall dividing the Occult Room from an adjoining bedroom.” Mr. Gribble appears to have been a veritable Balaam, brought by the missionaries to curse their enemies, and blessing them instead. Surely, with this overwhelming evidence, from so many sources, opposed to the one statement of Μ. Coulomb, written down by Mr. Hodgson, we ought to hear no more about fraudulent phenomena connected with the Shrine in the Occult Room at Adyar. This idea of the good missionary-agent will doubtless recommend itself to Hindus, who are accustomed to having food handed into their pūjā rooms! Probably the one intended for the back of the Shrine. Report of the Result, etc. Ρ. 103.
the Shrine was not fastened to the wall, as we have seen, but was merely hanging thereon and was easily removable. Would anyone out of Bedlam have concocted an elaborate apparatus for the fraudulent production of phenomena within it, and then have allowed it to hang loosely over the opening, so .that anyone could peep behind it and see the opening, or might remove, it and expose the whole affair? Apart from this, Madame Blavatsky was surrounded with phenomena wherever she went, and the Shrine was only made in 1883, after she went to Adyar; she could only at most have used it for the few months during which she was staying there, and its presence cannot explain the phenomena which are borne witness to by reputable American, European and Indian gentlemen, from 1874 to 1882. Moreover, the phenomena in connection with the Shrine also occurred after she had left Adyar for Europe. It is necessary, if the S.P.R. Report is to be credited, not only to condemn Madame Blavatsky as a fraud, but to condemn also the honorable gentlemen associated with her during all these years, as her fellow-conspirators and cheats. Even if they were her dupes while she was present, they must have become active participants in fraud when she was absent. unreliable.” Yet this utterly unreliable man, with his worthless evidence, is to be held to outweigh the great mass of testimony to the obvious identity of the writing in the letters received through Madame Blavatsky; and those received far away from her. Against Madame Coulomb’s word and the worthless opinion of the experts, Ι place the evidence given above on pp. 17-20, and contentedly leave the public to form its own opinion. Mr. Hodgson’s third charge is that certain letters alleged to be from the Mahātmā Koot Hoomi were written by Madame Blavatsky, or in some cases by Damodar. With regard to this young Hindu gentleman it may be said that he gave up family, wealth, and friends and became an outcaste, in order to devote himself to ceaseless work and hardships of all kinds, for the sake of the Theosophical Society. He lost everything for it, and only gained—his Master. The gain, truly, outweighed a million times the loss, if the gain were real. But on the hypothesis that Damodar made himself a party to a fraud, postulating a non-existent Master, one asks oneself: “To what end?” The high-class Brāhmana does not readily live and eat with Europeans, and become impoverished and an outcaste for their sake. Is it conceivable that he would suffer thus, in order to take part in a fraud which gave him nothing? 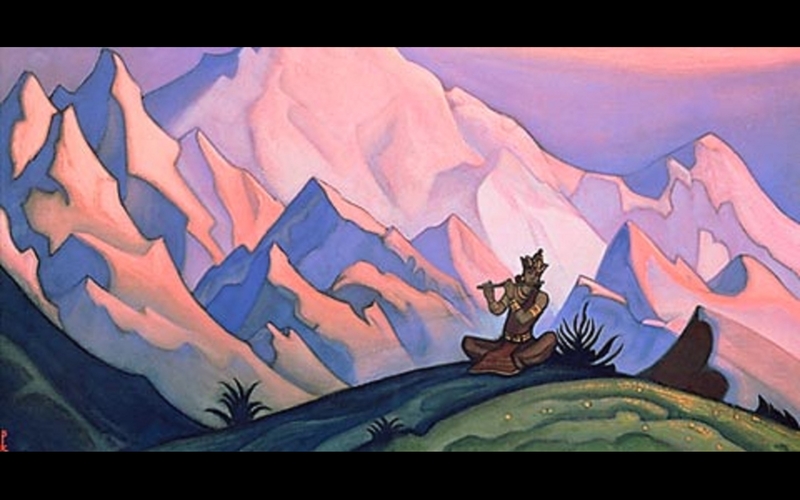 At any rate, he believed in the fraud sufficiently strongly to leave Adyar, when he became convinced that Madame Blavatsky would not return, to travel northwards, to plunge into the fastnesses of the Himalayas, and to climb over their snow-covered passes, in order to find the hermitage of Him in whom he believed. Thus he passed out of the story of the Society. Leaves from a Life. Ρ. 263.
conclusion. Certainly, on the surface, the two handwritings are as different as any two could be, and when we remember the immense mass of such letters received through her, it is difficult to conceive it to be possible that she should have written these innumerable sheets of MS without a falter, in the clear beautiful hand so unlike her own by no means admirable, though characteristic, caligraphy. But the really insuperable difficulty which lies in the way of Mr. Hodgson’s theory is that letters in this same beautiful and delicate script came to people in all sorts of ways in which Madame Blavatsky could, by no possibility, have taken part. Such letters were received, not by post, when she was thousands of miles away, and Ι have given above a number of cases of such writing having been received where it was physically impossible that she could have had anything to do with it. These are the solid facts placed against Mr. Hodgson’s suppositions. The airy and baseless character of his assumptions, in the absence of facts, strikes strangely on the sober reader. “It may have thus”; “it is probable that”; “it may be suggested”; so and so “may have done” such a thing. These are the variations from quotations from Μ. Coulomb. The one really original idea in the Report is the motive suggested by Mr. Hodgson for Mme. Blavatsky’s alleged proceedings. Here is a Russian lady, of admittedly high birth and social position, playing the fool in Europe, America and India, to her own financial and social ruin, gaining nothing but abuse and slander, when she might be living luxuriously in high dignity in her own land. Mr. Hodgson rejects the idea that she is a religious monomaniac; he admits that pecuniary gain was not her object, and discards the theory of a “morbid yearning for notoriety.” “Α casual conversation opened” his eyes at last, and he discovered the secret of her strange career: she was a Russian agent, and “her ultimate object has been the furtherance of Russian interests.” This sapient conclusion is, perhaps, the best criterion of Mr. Hodgson’s ability, the more so as it is partly based on a “fragmentary script which forms one of the Blavatsky-Coulomb documents”—in plain English, a torn scrap picked out of Madame Blavatsky’s waste-paper basket by Madame Coulomb. translation has been preserved, several hundred pages of Mme. Blavatsky’s writing, blazing with sentiments of the most ardent Anglo-phobia. It is most likely, as Ι say, that the pilfered slip of which he is so proud, was some rejected page from that translation, unless, indeed, which would be more amusing still, it should happen to have fallen from some other Russian translations which Mme. Blavatsky, to my certain knowledge, once made for the Indian Foreign Office during one of her visits to Simla, when she made the acquaintance of some of the officials in that department, and was employed to do some work in its service. It was, as a matter of fact, part of the translation of Grodekoff’s Travels, which Mr. Hodgson obtained from Madame Coulomb. This is the only motive that Mr. Hodgson can discover for the frauds of which he accuses her, and these, be it remembered, must have been begun in America in 1874. If the Report should live, through its connexion with the noble woman whom it slanders, surely, in the centuries to come, this charge of Mr. Hodgson’s will be met with inextinguishable laughter, and men will wonder at the folly of those who gave any credit to this young man. The Occult World Phenomena. Pp. 9-11. The Occutt World Phenomena. Pp. 7, 8 and 12.
of letters alleged to be written by me to Mme. Coulomb in connection with the supposed conspiracy, which letters Ι have already myself declared to be in large part fabrications. Strange to say, from the time the investigation was begun, fourteen months ago, and to this day, when Ι am declared guilty by my self-instituted judges, Ι was never permitted to see those incriminating letters. Ι draw the attention of every fair-minded and honorable Englishmanto this fact. “Without at present going into a minute examination of the errors, inconsistencies, and bad reasoning of this Report, Ι wish to make as publicly as possible my indignant and emphatic protest against the gross aspersions thus put upon me by the Committee of the Psychical Research Society at the instigation of the single, incompetent, and unfair inquirer whose conclusions they have accepted. There is no charge against me in the whole of the present Report that could stand the test of an impartial inquiry on the spot, where my own explanations could be checked by the examination of witnesses. They have been developed in Mr. Hodgson’s own mind, and kept back from my friends and colleagues while he remained at Madras abusing the hospitality and unrestrained assistance in his inquiries supplied to him at the Headquarters of the Society at Adyar, where he took up the attitude of a friend, though he now represents the persons with whom he thus associated—as cheats and liars. These charges are now brought forward supported by the one-sided evidence collected by him, and when the time has gone by at which even he could be confronted with antagonistic evidence and with arguments with which his very limited knowledge of the subject he attempted to deal with do not supply him. Mr. Hodgson, having thus constituted himself prosecutor and advocate in the first instance, and having dispensed with a defence in the complicated transactions he was investigating, finds me guilty of all the offences he has imputed to me in his capacity as judge, and declares that Ι am proved to be an arch-impostor. “The Committee of the Ρ. R. S. have not hesitated to accept the general substance of the judgment which Mr. Hodgson thus pronounces, and have insulted me publicly by giving their opinion in favor of their agent’s conclusions—an opinion which rests wholly and solely on the Report of their single deputy. inquiries, his affected precision, which spends infinite patience over trifles and is blind to facts of importance, his contradictory reasoning and his manifold incapacity to deal with such problems as those he endeavored to solve, will be exposed by other writers in due course, Ι make no doubt. Many friends who know me better than the Committee of the Ρ. R. S. will remain unaffected by the opinions of that body, and in their hands Ι must leave my much-abused reputation. But one passage in this monstrous Report I must, at all events, answer in my own name. upon the character of a spy with the disgust which only a Russian who is not one can feel, Ι am impelled irresistibly to repudiate Mr. Hodgson’s groundless and infamous calumny with a concentration of the general contempt his method of procedure in this inquiry seems to me to merit, and to be equally deserved by the Committee of the Society he has served. They have shown themselves, by their wholesale adoption of his blunders, a group of persons less fitted to explore the mysteries of psychic phenomena than Ι should have thought—in the present day, after all that has been written and published on the subject of late years—could have been found among educated men in England. “Mr. Hodgson knows, and the Committee doubtless share his knowledge, that he is safe from actions for libel at my hands, because Ι have no money to conduct costly proceedings (having given all Ι ever had to the cause Ι serve), and also because my vindication would involve the examination into psychic mysteries which cannot be dealt fairly with in a court of law; and again because there are questions which Ι am solemnly pledged never to answer, but which a legal investigation of these slanders would inevitably bring to the front, while my silence and refusal to answer certain queries would be misconstrued into ‘contempt of court.’ This condition of things explains the shameless attack that has been made upon an almost defenceless woman, and the inaction in face of it to which Ι am so cruelly condemned. That the Society was only worthy to live, if it were a witness to and a channel for the Masters’ teachings, was her constant declaration, and she only cared for it as an instrument for carrying out Their work in the world. The Following is from “Theosophy And The Theosophical Society” by C. W. Leadbeater. The Theosophist, 1930 Pages 938 – 945. “Some people accepted all that Madame Blavatsky told them just because she said it. I can understand their position, I think, because she obviously knew so enormously more than we did about these things, that it was very tempting to take it all, especially as it seemed to account for so very many things which before we had not been able to understand at all. But in the midst of her work there came out that “Psychical Research Report” which condemned Madame Blavatsky as possibly a charlatan and having probably played many tricks. I suppose you have read that report in your time, and I hope you have also read the comments upon it. I was at Adyar myself when Mr. Hodgson came out there to make that investigation. He was very young and obviously not very well acquainted with psychic matters. I had my own opinion of the way in which he carried out his investigation! I gave him a considerable amount of testimony, but he did not refer to that in any way in drawing up his decision, and I know the same was the case with several others of our people there. He cross-examined us but apparently made no use whatever of what we told him of the honesty of Madame Blavatsky; perhaps he did not believe us; at any rate he sent in a report which induced people to condemn her. The following is from Adyar Pamphlet No 101 “Is Belief in the Masters Superstitious or Harmful” by Annie Besant. “The insults, the mud, which fanatics and sceptics throw upon her memory, disgrace only the throwers. Evidence of the possibility of the facts she alleged has been accumulating since she passed away. Those who have looked into the evidence against her know how weak it is. See the book “H. P. BLAVATSKY and the SPR. An Examination of the Hodgson Report of 1885” by Vernon Harrison, Ph.D. TUP, 1997. And audio tape from The SPR—Harrison, V.: (531) Blavatsky & SPR.